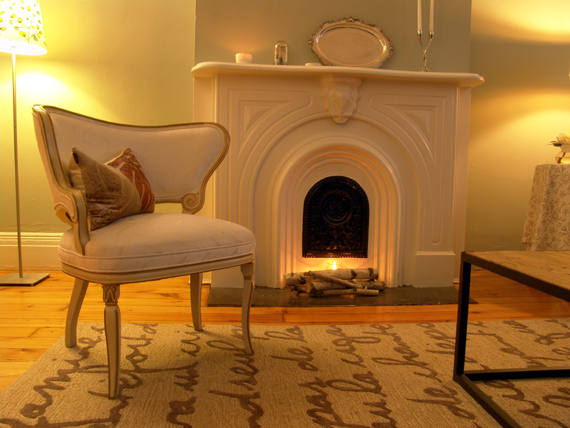 Pretty without the pretense, our goal was to make our living room the most inviting space in the house. It’s the first room guests see when they walk through the door so it had to look polished but, once first impressions are out of the way, the idea is to get comfy. 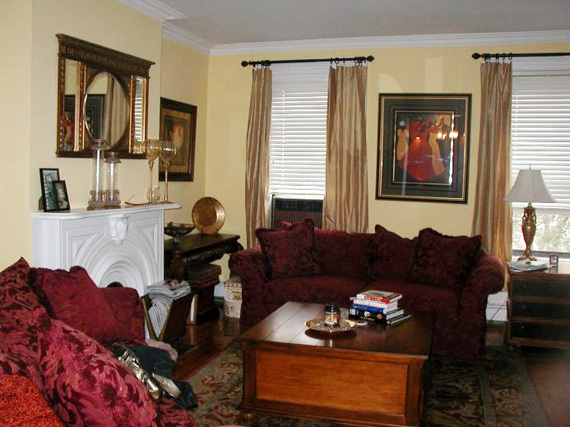 Maroon damask and gold accents set the tone for a formal and “mature” space. And I wanted nothing to do with that. The architecture of the room with its cove molding, 19th-century fireplace, and plaster ceiling medallion already said that. What it needed was some soft, contemporary touches to counter it. These 1940s French chairs are the sassiest and most sophisticated thing I’ve ever purchased. Asymmetrical and curvaceous, I love that they command attention but I wasn’t going to let them take over the room. 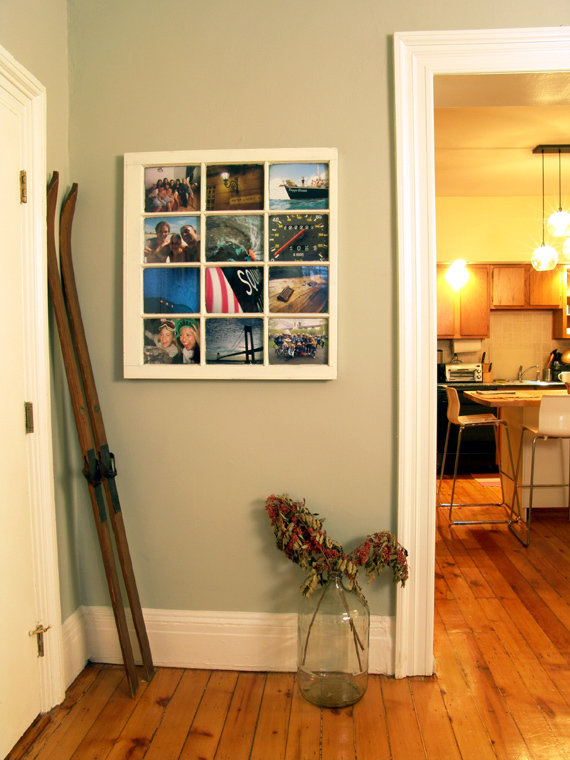 To balance the space, I paired them with their polar opposite design: the nitty-gritty bricklayer’s table. The steel box formation and reclaimed-wood top bring a touch of boy to the semi-girly decor. For optimal television viewing, the most logical place to put the TV would be over the fireplace—but I couldn’t bear to do it. I didn’t want a black hole of a plasma and the back of a sofa to be the first thing you saw when you walked in the room. 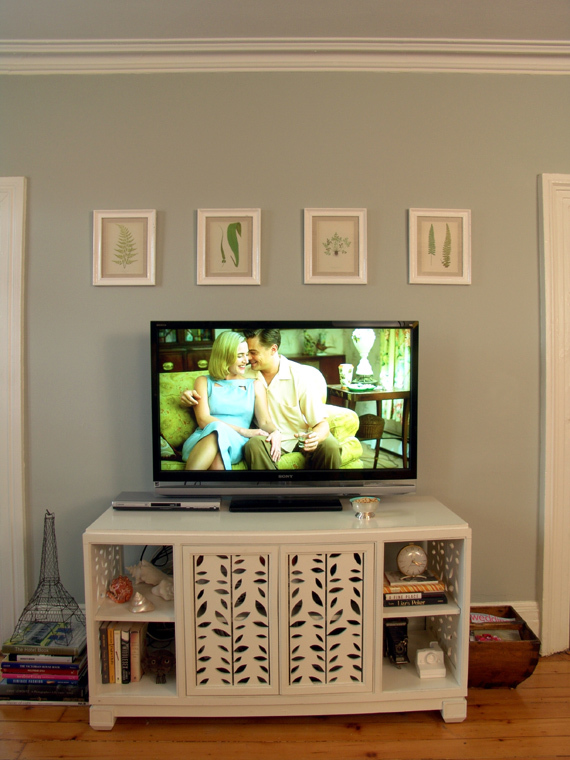 To remedy this, we placed the TV on the same wall as the front door so guests could take in the full space before arriving at the inevitable electronics–and my fabulous Matisse cabinet. The delicate leaf-cutouts lighten the large piece of furniture and its compartments are perfect for favorite tchotchkes. The prints, above, are the latest addition to the house and were a year in the making, so I’ll save that explanation for a later post. Though the frilly chairs may fool you, this is one tough living room design. The chocolate brown upholstery on the Grayson sofa, the indoor-outdoor Le Poeme rug, and a distressed coffee tabletop can all handle a party without a scuff. Still in need of window treatments, mantel art, and a bookshelf, this living room–and apartment–is a work in progress. From the projects that make the house run a little smoother to the accessories that make us smile, decorating has become a lifestyle that we won’t be done with anytime soon.